Where did your pastor get that cool notebook? 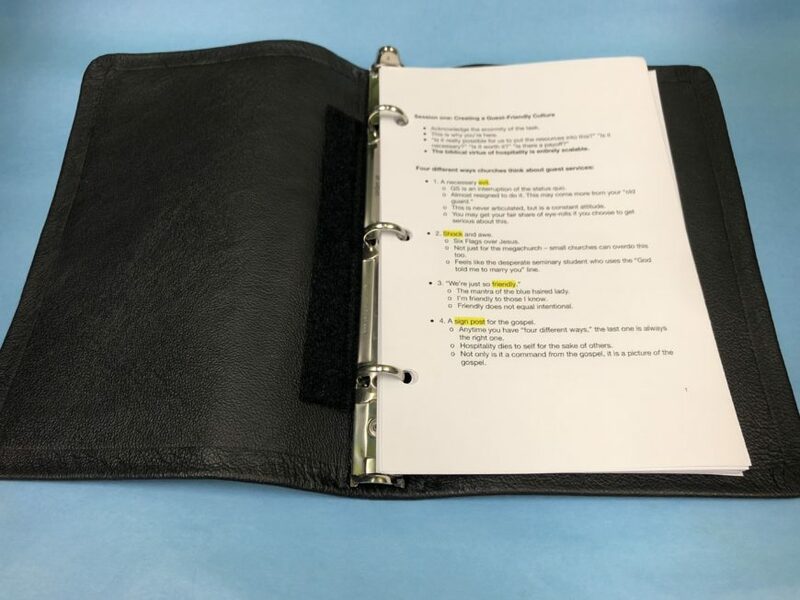 If you’ve ever watched a video of a sermon at the Summit, you’ll notice that our pastor preaches out of a three-ring leather notebook. Over the years, the notebook’s popularity has exploded on our staff. We may actually have more teaching notebooks than staff members. Which is fine, because teaching notebooks don’t leave their leftover shrimp scampi in the office fridge. (I’m lookin’ at you, Steve). I successfully avoided the notebook trap for many years, choosing instead to utilize notes stuck in my Bible (they fall out) and notes that I scrolled on an iPad (too risky to depend on tech). But a few months ago, I borrowed a friend’s notebook for a speaking assignment, and before I got past my intro I knew that I had to have one. The notebooks are hand-made by Randall Creel, a Mississippi evangelist. They’re durable and dependable. I print my notes out on an 8.5 x 11 landscape size, which means I fold it over before inserting it in the notebook, which means (#nerdalert) it’s much easier to flip the pages quickly, since they don’t cling together. They’re not necessarily cheap. Notebooks run between $55-60, depending on imprinting. But did I mention that they are ridiculously durable? On a side note, Pastor Creel is a guest services hero of mine. Throughout the ordering and delivery process, he updates you on every. single. step. I knew almost to the minute when my notebook was going to arrive, and then he followed up afterward to make sure I was completely happy with it (spoiler alert: I was). If you’re a preacher, a teacher, or any kind of speaker, I highly recommend that you check out Pastor Creel’s notebooks. Tell him the Summit sent you. Disclaimer: FTC watchdogs will probably want to know that the companies or products listed / linked above did not ask for this endorsement, nor did they provide me with free swag in order to do so. I’m just a really satisfied customer who wants to let you know where you can get some great products. So there.